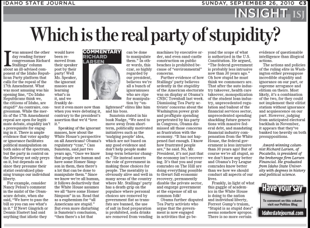 Which Is The Real Party of Stupidity? Home Culture Which Is The Real Party of Stupidity? I was amused the other day reading Richard Stallings’ column about an ill-advised component of the Idaho Republican Party platform that calls for the repeal of the 17th Amendment. What was most amusing was his opening line, “Do Idaho Republicans think we, the citizens of Idaho, are stupid?” Au contraire, Congressman. While the merits of the 17th Amendment repeal are open for legitimate debate, stupidity isn’t a prerequisite for engaging in it. There is ample evidence that voter apathy or ignorance facilitates political manipulation on both sides of the spectrum, but the party in control on the Beltway not only preys on it, but depends on it since they presume their statist centralized planning trumps our individual liberty. Speaking of the ignorant masses, how about the White House’s perspective on all Americans? Obama’s regulatory “czar,” Cass Sunstein, said just two years ago, “Once we know that people are human and have some Homer Simpson in them, then there’s a lot that can be done to manipulate them.” Since we know we’re all human, it follows deductively that the White House assumes we all “have some Homer Simpson” in us. Read that as a euphemism for “all Americans are stupid.” But even more disturbing is his conclusion, “then there’s a lot that can be done to manipulate them.” In other words, this czar, so highly regarded by our president, believes we’re all a bunch of ignoramuses who are ripe for manipulation by “enlightened” elites like him and his boss. Sunstein stated in his book Nudge, “We need to move away from short-term, politically motivated initiatives such as the ‘nudging people’ idea, which are not based on any good evidence and don’t help people make long-term behaviour changes.” He instead asserts the role of government in making those choices for people. The mentality is obviously alive and well in many areas of the country where Mr. Stallings’ party has a death-grip on the populace where personal choices are removed by government fiat as trans-fats are banned, the use of salt in food preparation are prohibited, soda drinks are removed from vending machines by executive order, and even sand-castle construction on public beaches is prohibited because of “environmental” concerns. Further evidence of how Stallings’ party believes ardently in the stupidity of the American electorate was on display at Obama’s CNBC Townhall this week. Dismissing Tea Party activists’ concerns about the Washington power grab and profligate spending perpetrated by his party in Congress, Obama dismissed all those concerns as frustration with the economy. “It has not happened fast enough. I know how frustrated people are,” he said. No, Mr. President, it’s not just that the economy isn’t recovering. It’s that you and your comrades on The Hill are doing everything possible to thwart full economic recovery, permanently disable the private sector, and engorge government at the expense of all us common folk! Obama further disputed tea party activists who argue that the government is now engaged in activities that go beyond the scope of what is authorized in the US Constitution. He argued, “The federal government is probably less intrusive now than 30 years ago.” Oh how stupid he must think we commoners are. That after the auto industry takeover, health-care takeover, monopolization of the student loan industry, unprecedented regulation and bailout of the financial services sector, unprecedented spending shackling future generations with massive federal debt, and mandating financial industry compensation from the White House, the federal government is less intrusive than 30 years ago? But of course we’re all stupid, so we don’t know any better and his Ivy League comrades know better than we how we should conduct all aspects of our lives. Frankly, in light of what this gaggle of academics in the White House is doing to the nation and individual liberty, Forrest Gump’s truism, “Stupid is as stupid does” seems somehow apropos. There is no more certain evidence of questionable intelligence than illogical actions. The actions and policies of the ruling elite in Washington either presuppose incredible stupidity and ignorance on our part, or supreme arrogance and elitism on theirs. Most likely, it’s a combination of the two, for they could not implement their elitist statism without ignorance and acquiescence on our part. However, judging from anticipated electoral backlash in November, it appears that they’ve banked too heavily on both presuppositions.